- Capacity: 10, 000 kg. 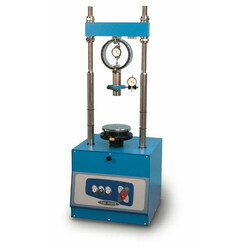 CBR Testing machine (California Bearing Ratio) helps in determining California bearing ratio through conducting load penetration test under laboratory conditions. The California bearing ratio test is performed as penetration test that assists in evaluation of sub-grade strength of pavements and roads. Complete with load frame, hand operated/electrically operated 5000 kg capacity, c. B. R. Mould, penetration piston, perforated plate, displacer block, anuular/slotted metal weight 2. 5 kg, metal tripod stand, rammer 2. 6 kg/4. 89 kg., with calibration certificate. - 1 Proving Ring, 10 kN capacity. - 1Proving Ring, 28 kN capacity. Annular & Slotted Metal Weight: 2.5 kg. Displacer Block : 148 mm dia with T-Handle. Rammer Weight: 2.6 kg & 4.89 kg. 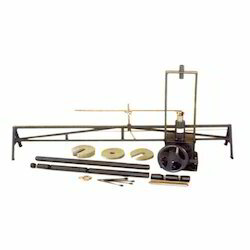 • Load Frame 50 KN capacity electrical / hand operated. • Mild Steel or Gun Metal mould 150mm dia x 175mm high. • Rammer 4.89 Kg & 2.6 Kg.